To mark the anniversary of Gord Downie’s death, a few hundred people gathered with the Tragically Hips Rob Baker and Johnny Fay. To mark the anniversary of Gord Downie's death, a few hundred people gathered along with the Tragically Hips' Rob Baker and Johnny Fay, and joined Choir! Choir! Choir! for a rendition of Grace, Too. 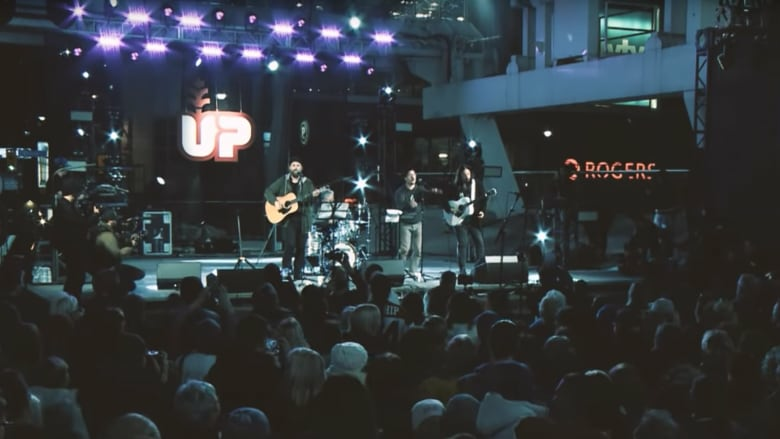 "On Oct 11th, we performed this massive sing-along at Yonge-Dundas Square in Toronto with Johnny Fay and Rob Baker, from The Tragically Hip, to commemorate the anniversary of Gord Downie's death as well as celebrate the date of legalization in Canada, something that Gord was very passionate about," wrote Choir! Choir! Choir! 's Nobu Adilman. "We encourage you all to sing along with us as you watch, what we feel is, a fitting tribute. We all miss you, Gord."